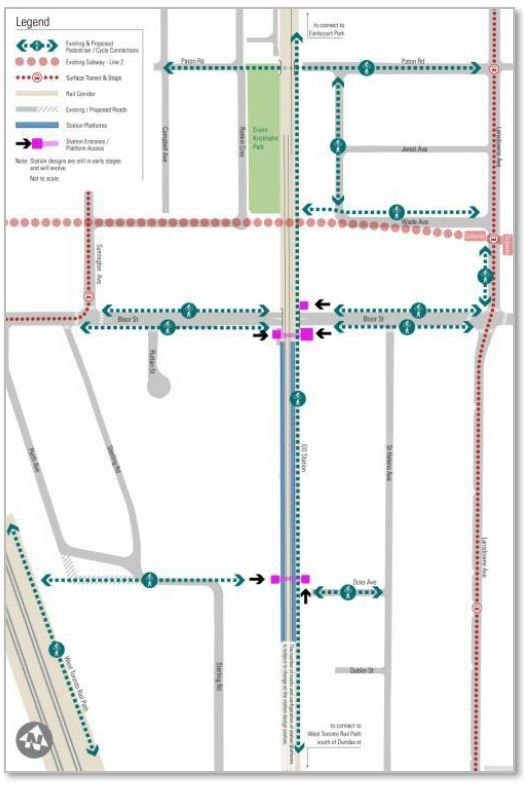 For the coming three evenings, October 10-12, the City of Toronto, Metrolinx and the TTC will host open houses to present and discuss plans for six new SmartTrack and two new GO Transit stations. Although material for all stations will be part of each event, stations “local” to each site will receive more emphasis than others. Each meeting will run from 6:30 to 8:30 p.m., with a presentation at 7 p.m.
Tuesday, October 10, Scarborough Civic Centre, 150 Borough Dr.
Wednesday, October 11, Riverdale Collegiate Institute, 1094 Gerrard St. E.
Note: The location of the Oct. 12 meeting has been changed and it is now across the street from the originally announced site (which was Bloor Collegiate). Updated October 11 at 10:30 pm: There continues to be confusion about just what “SmartTrack” service will look like, and this is not helped by the City’s presentation. Details can be found in the June 2016 Metrolinx report. For further info, see the update at the end of this article. Updated October 13 at noon: Metrolinx has confirmed that the Barrie corridor trains will operate through to Union Station, not terminate at Spadina/Bathurst Station as I had originally thought. However, the operational details have not yet been worked out. 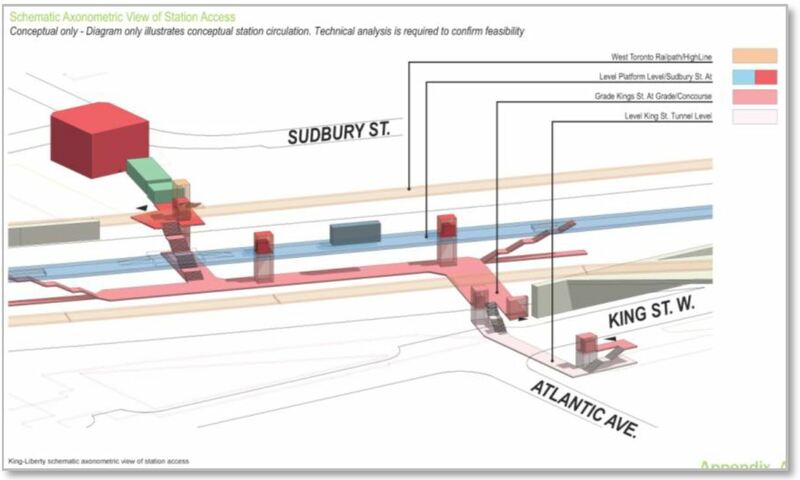 For further discussion, scroll down to the section on the Spadina/Bathurst Station. I attended a media briefing that covered the materials to be presented and the following article is based on that briefing which was conducted by City of Toronto staff. Illustrations here are taken from the deck for the media briefing which is available on the City of Toronto’s site. Resolution of some images is constrained by the quality of data in the deck. The City does not want to build traditional GO stations dominated by parking. The interface between the new stations and the transit network (both rapid transit and surface routes) should be optimized. Strong pedestrian and cycling connections are required. Stations should be close to main streets. 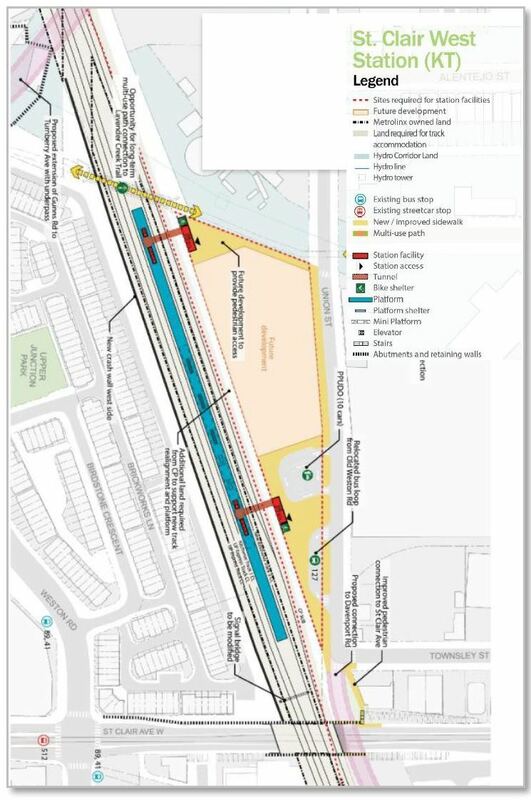 Stations should support other City objectives such as the West Toronto Railpath and parallel projects such as the St. Clair/Weston study now in progress. Transit-oriented development should be possible at stations. 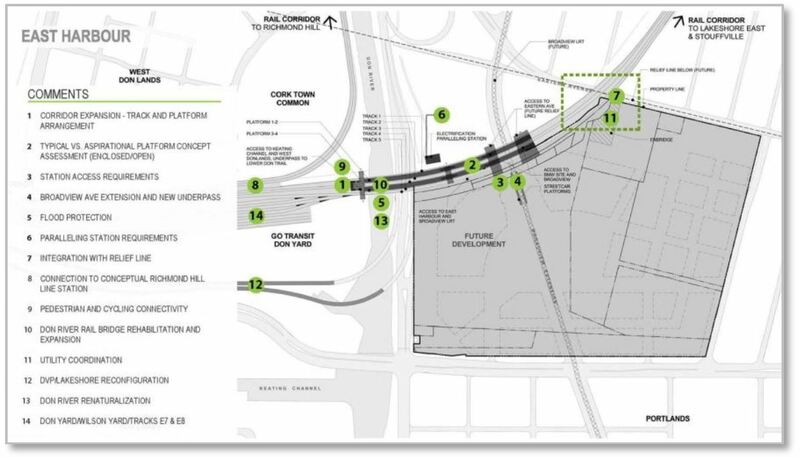 This is a list that to a typical GO Transit proposal in the 905 would be unrecognizable. GO Transit’s plan ever since its creation has been to serve auto-based commuting first and foremost with ever larger parking structures that poison the land around stations. Local transit was something GO, and later Metrolinx, simply “didn’t do”, and the idea that Queen’s Park might fund strong local transit as a feeder to GO services has been limited to co-fare arrangements. The situation within Toronto is very different, and there are connecting routes on the TTC that individually carry a substantial proportion of the daily ridership of the entire GO network. Moreover, if GO (or SmartTrack, whatever it is called) will be a real benefit to TTC riders, then the process of getting people to and from stations must not depend on parking lots that are full before the morning peak is even completed. The new stations will go into existing built-up areas, not into fields with sites determined primarily by which well-connected developer owns nearby property. Residents will be consulted about how these stations will fit their neighbourhoods, how they will be accessed, and what might eventually become of the community and future development. A big problem facing those who would present “SmartTrack” to the public beyond City Hall insiders and neighbourhood activists is that almost nobody knows what SmartTrack actually is. This is a direct result of Mayor Tory running on a design that could not be achieved, and which has evolved a great deal since he announced it in May 2014. In brief, it is three GO corridors (Stouffville, Lake Shore East and Kitchener) plus an Eglinton West LRT extension, but this differs greatly from what was promised in the election. Service levels for SmartTrack are described as every 6-10 minutes peak, with off-peak trains every 15, but this does not necessarily match Metrolinx’ announced service plans for their GO RER network onto which SmartTrack is overlaid. The idea that there would be extra SmartTrack trains added to the GO service was killed off in 2016 in the evaluation of possible operating modes for the corridor. Fares on “SmartTrack” are supposed to be “TTC fares”, but this is a moving target. Voters understood the term to mean free transfer onto and off of SmartTrack trains as part of their TTC fare, but with all the talk of regional fare integration, it is far from clear just what a “TTC fare” will be by the time SmartTrack is operating. Even that date appears to be a moving target. City Staff referred to 2025 when GO RER would be fully up and running as the target date for “integration”, but Mayor Tory still speaks of being able to ride SmartTrack by 2021 while he is presumably still in office to cut the ribbon. At the briefing, many questions arose from the media, and the answer to almost all of them was “we don’t know yet”. It is clear that the Mayor’s plan has not proceeded beyond the half-baked stage, and many important details remain to be sorted out. What is the status of Lawrence East Station and how does it fit with the recently announced review of this (and Kirby) stations by the Auditor General? How will an expanded GO/ST presence at Lawrence East co-exist with the SRT which will operate until at least 2025, if not beyond to whenever the Scarborough Subway opens? 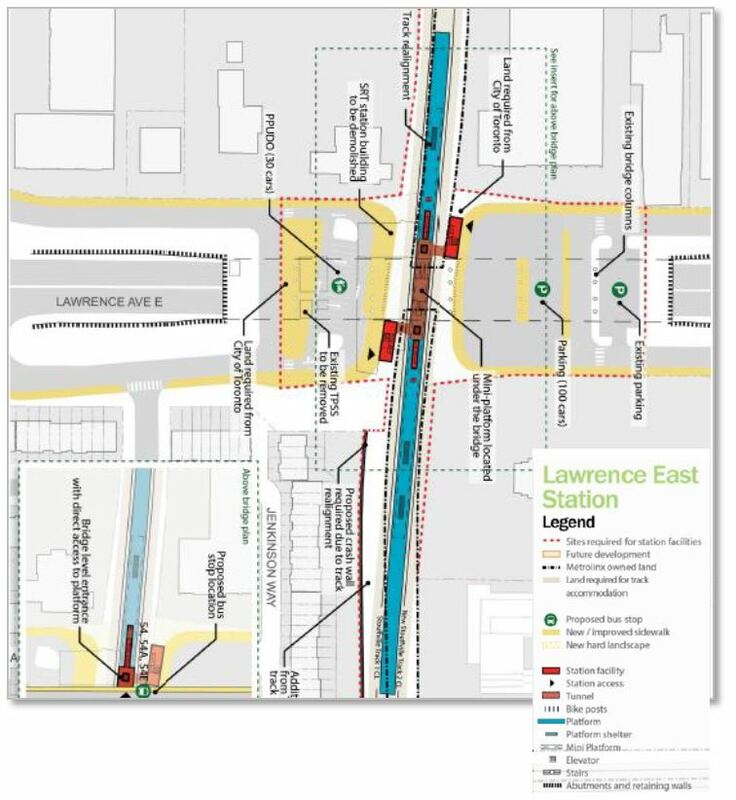 What are the arrangements for City/Province cost sharing on the stations, especially since Lawrence East was originally to be a GO station, but its future as such is unknown? What will be the cost of the new stations once design reaches a level where the numbers are credible? The range of $700 million to $1.1 billion has not been updated since the matter was before Council. Will all stations on the SmartTrack corridor honour ST fare arrangements regardless of whether this is a city-built station under the ST banner? Why should GO riders who are not on the SmartTrack corridor pay regular GO fares, while those using the ST route have a “TTC fare” for their journey? The most obvious contrast in this case is between the existing Exhibition Station on the Lake Shore corridor and the proposed Liberty Village Station on the ST/Kitchener corridor, but there are many others. 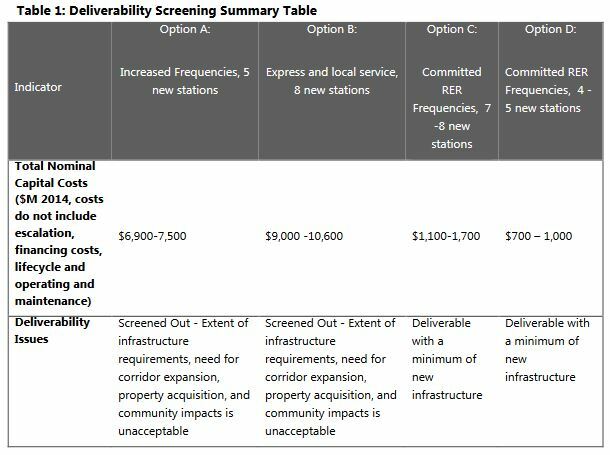 What service levels will be provided, and how will they affect projected demand at the stations? Were previously published estimates based on more ST service than Metrolinx actually plans to operate? How will constraints at Union affect the ability to through-route service between the Stouffville to the Weston/Kitchener corridors? If the City wants more service than Metrolinx plans (assuming it would even fit on the available trackage), how much would Toronto have to pay Metrolinx to operate it? Where are the residents and jobs that are expected to generate ST demand, and how convenient will access to the service actually be considering walking time, station geometry (stairs, tunnels, bridges, etc) and service frequency? The stations under consideration are shown on the map below. A common question for all of these locations will be that of available capacity on the GO trains that will originate further out in the corridor. Without knowing the planned service design for “GO” trains and “SmartTrack” trains, it is unclear how often, if at all, there will be short-haul ST trains originating within Toronto as opposed to longer-haul GO trains from the 905. The availability of space on trains could affect the perceived service frequency if people cannot board at stations near Union (just as long-suffering riders of the King car complain about full streetcars). After I posted this article, I realized that there was an important part missing, a commentary on the “consultation” process itself. A big problem with many attempts to seek public input is that the wrong question is posed, and factors are taken as given when they should be challenged. In the case of SmartTrack, the basic question is “why do we have SmartTrack at all”. The original scheme was essentially a real estate ploy to make property in Markham and south of the Airport more valuable by linking both areas with a frequent rail service to downtown. Reverse commuters were a big potential market for this service. In the course of becoming part of the Tory election campaign, the focus turned inward, and SmartTrack became the line that would solve every transit problem. The claims about service frequency, fares and integration with other local and regional service were complete fantasies, but they gave the impression that Tory “had a plan” as distinct from the bumbling proposals of his opponent, Doug Ford, and the lackluster efforts of Olivia Chow. Tory even got professionals to declare his scheme a great idea, one giving it an “A+” on CBC’s Metro Morning, but this was for a version of SmartTrack that was unbuildable. Now, over three years later, we are still faced with the myth that SmartTrack is a real plan, that it is anything more than what GO Transit would have done in the fullness of time. We are, in effect, being asked about the colour of tiles in stations when we should be asking whether the stations should even be built at all. There is no guarantee that service can be overlaid on GO’s existing plans to provide anywhere near what was promised in the campaign – a “surface subway”. Metrolinx has been quite firm on the subject, and going to the frequencies assumed by ST advocates would be well beyond the infrastructure we are likely to see on GO corridors. 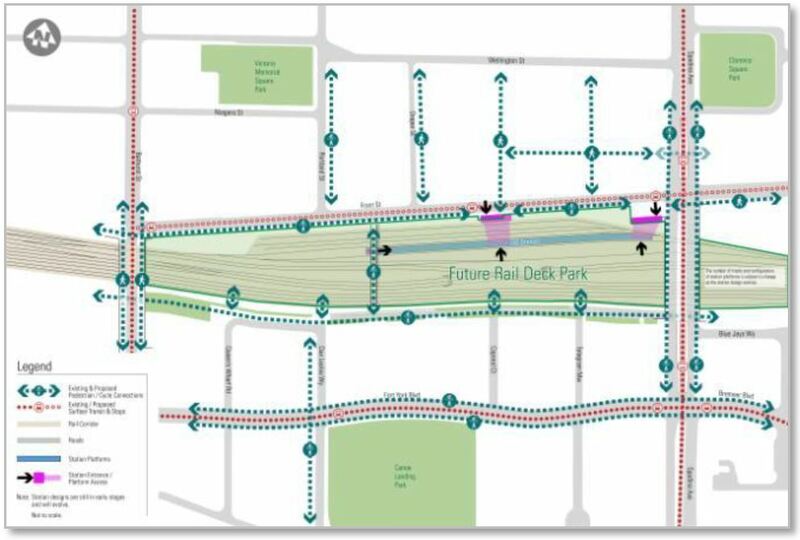 The City will conduct its consultations, but the hard question – Why SmartTrack? – will never be asked. For the October 11 update, please scroll to the end of the article. The intersection of St. Clair Avenue, Keele Street and Weston Road was once the centre of much industrial activity, but it is now a built-up collection of new housing and big box stores. Just east of the intersection, St. Clair dives under the GO Weston/Kitchener corridor through a narrow underpass that is only four lanes wide. This area is the subject of a separate study to reconfigure and improve local streets and transit. The illustrations below show the original proposal for this station, the revised version and the circulation plans. 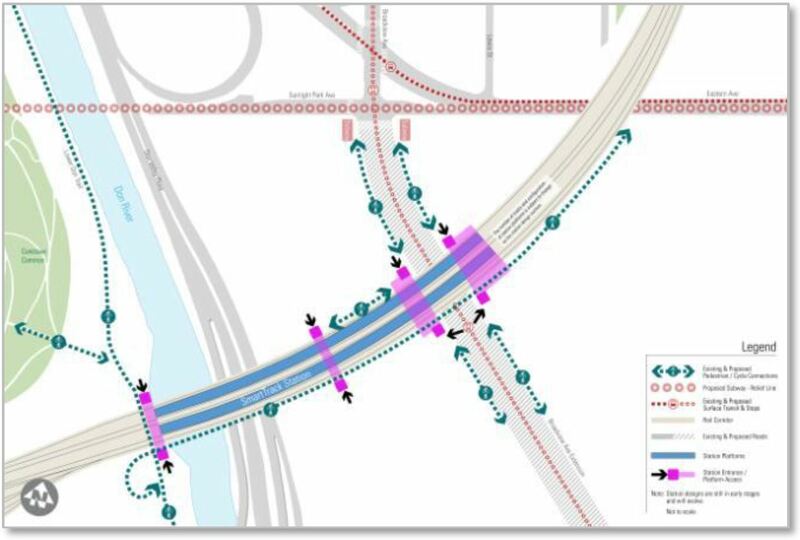 The revised version is based in part on work now underway for the area study, and importantly it recognizes the need for multiple paths through what were once impenetrable areas. 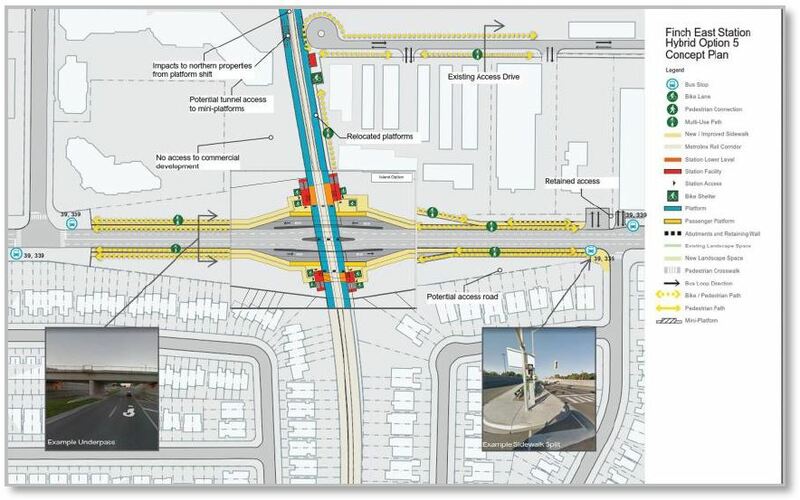 A challenge for this site is the grade separation close to the intersection. This makes a direct link between transit service on the major nearby routes almost impossible (512 St. Clair, 89 Weston and 41 Keele). Liberty Village Station is something of a misnomer being located north of King Street when the actual area giving its name is south of King to the Lake Shore West rail corridor. 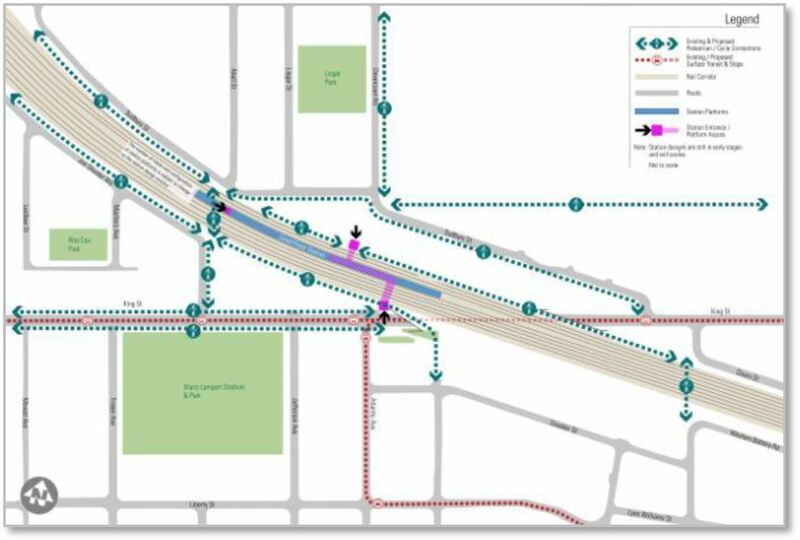 An important consideration for this location will be the access times from various points within the dense residential developments north and south of King to this station, as compared to the streetcar service including possible improvements on both the King and Queen routes in reliability and capacity. 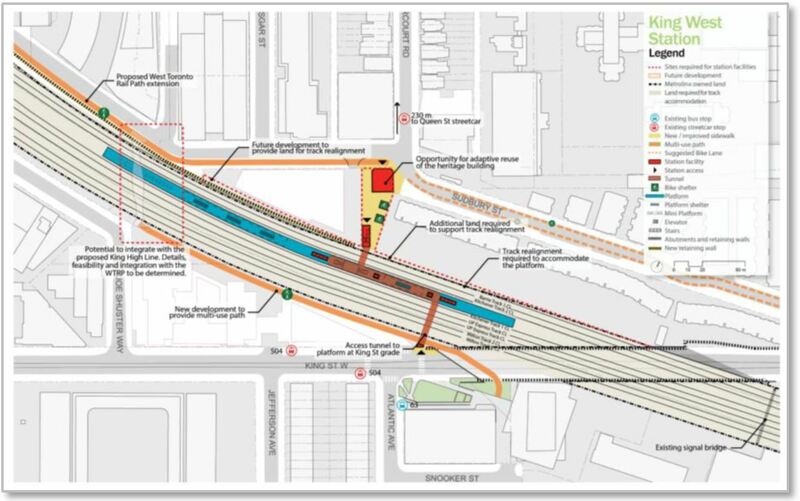 Access to the proposed platform is from below with a concourse linked to entrances both at King itself, and north of the rail corridor at the intersection of Dovercourt and Sudbury. 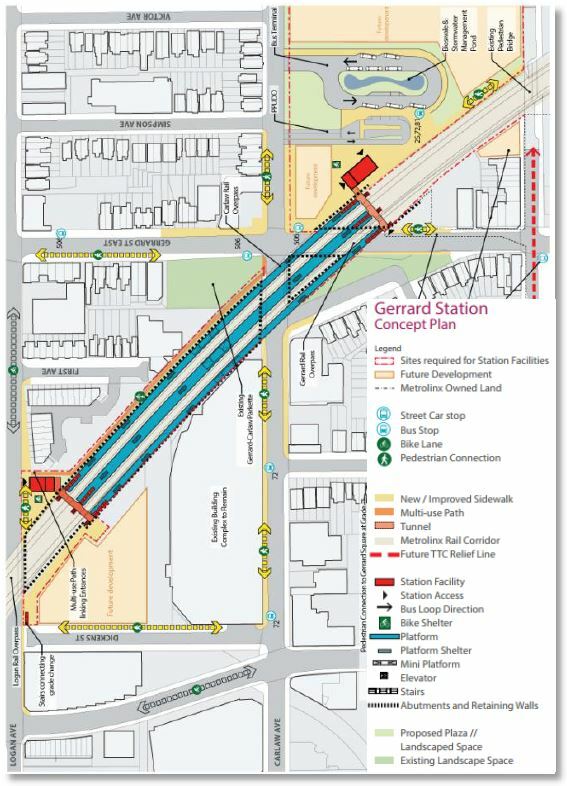 Gerrard Station has been considerably revised and shifted to the northeast. 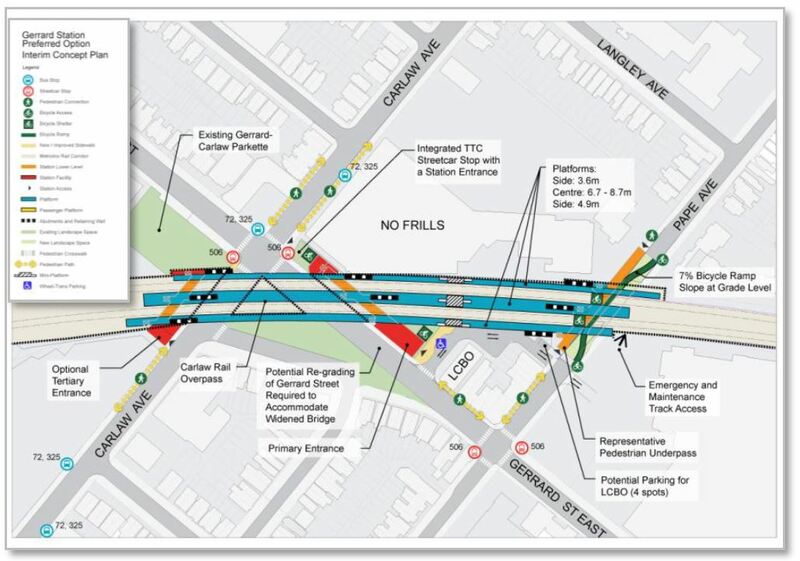 This better fits with the proposed location of a corresponding Relief Line station (where the route will jog west from Pape to Carlaw) as well as to potential development on lands north of the rail corridor. 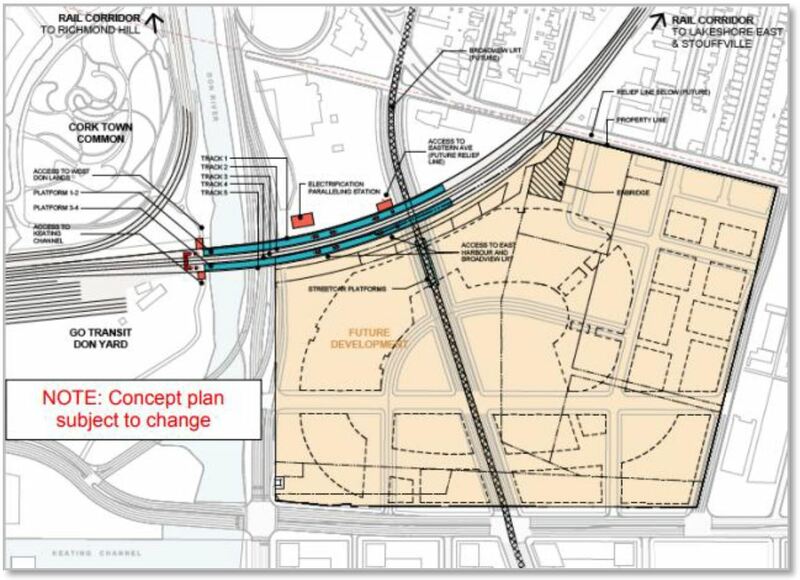 An intriguing question for construction planners will be whether to prebuild some parts of the RL station so that the site does not have to be disturbed again when and if that project gets underway. 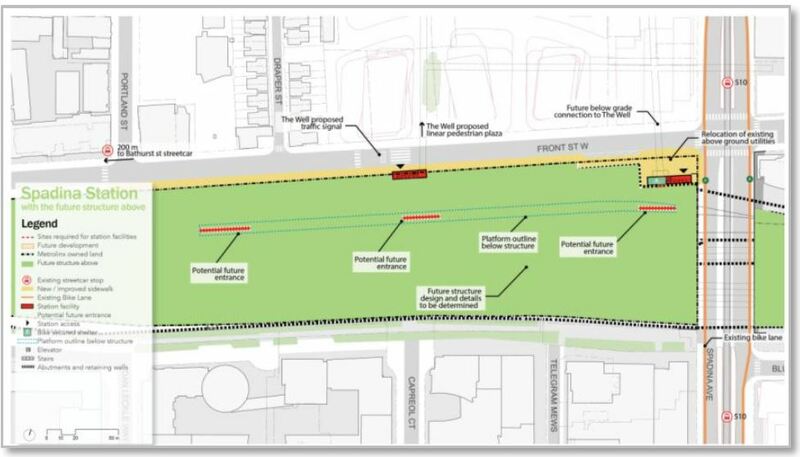 Worth noting in the revised design is that the TTC bus and streetcar terminal (which included provision for an extended 505 Dundas route) has been removed. Frankly, it did not make much sense. East Harbour will be a complex node in the transit network serving a major development at the former Unilever site with GO and ST services on the rail corridor, a north-south Broadview streetcar extension (running south to the line on Commissioners Street), and with a Relief Line station just to the north at Broadview and Eastern Avenue. Details of how all this will fit together are incomplete because the stations will be integrated with planned development. 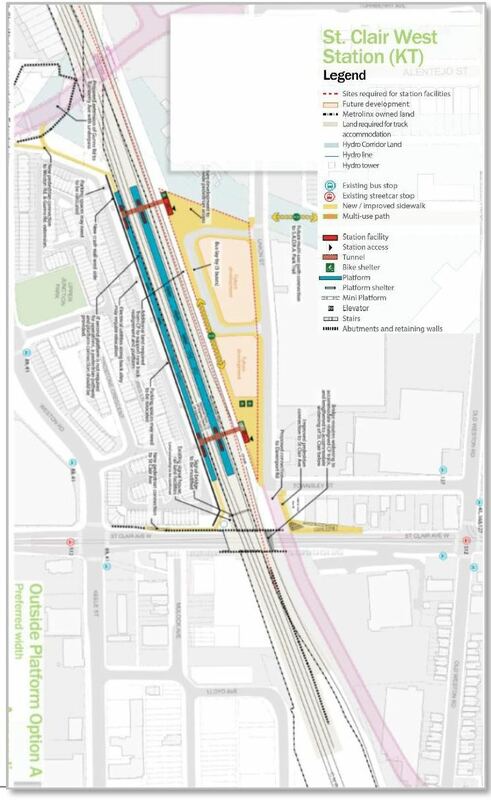 Although this is nominally a “SmartTrack” station, it is clear that this will also be a major stop for GO if the employment development expected in the eastern waterfront materializes. Geometrically the station is challenging because it must also fit among the Gardiner Expressway ramps to the DVP and existing GO Transit facilities on the west side of the Don River. The rail corridor itself is also part of the flood protection system for the east side of the river. 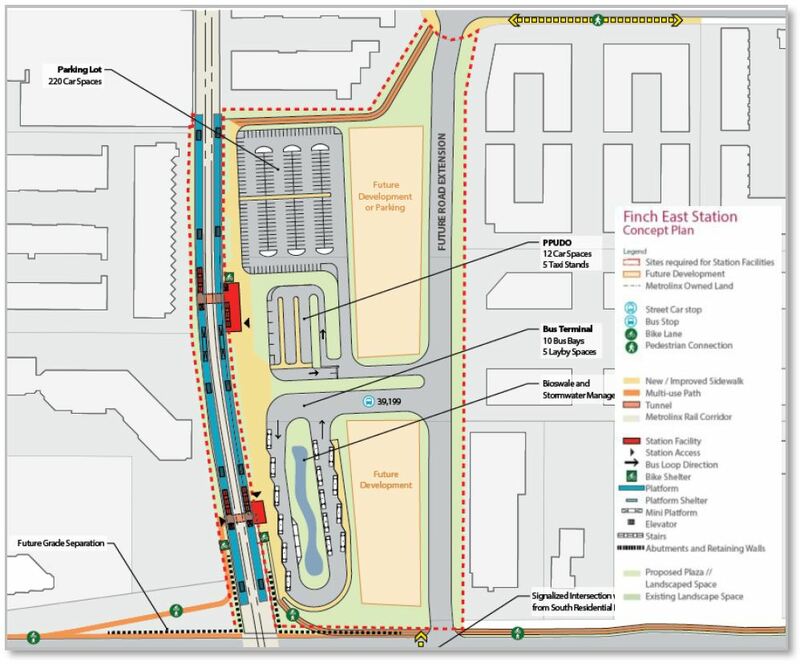 The original plan for Finch East Station included a parking lot and a bus terminal with bays far more numerous than the routes that pass here. 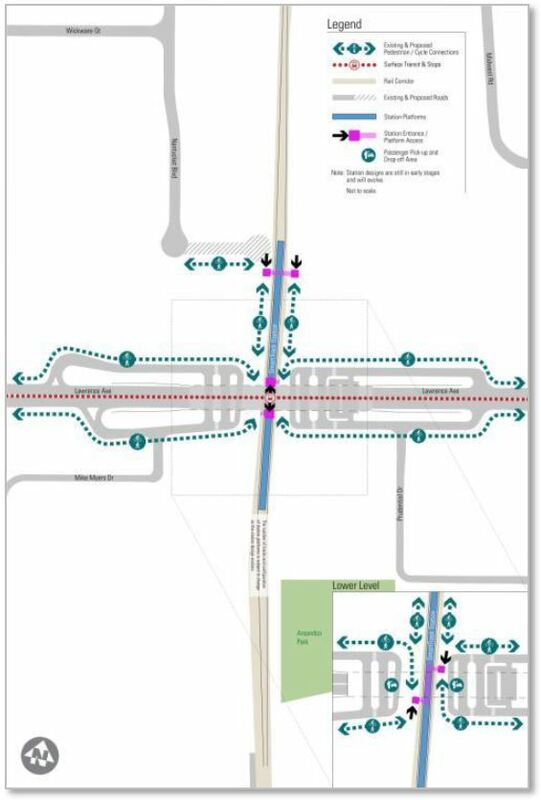 Also, there was no grade separation with Finch Avenue even though Metrolinx had announced support for this plan. The new station includes the grade separation, with buses stopping in the underpass, and the station is shifted south because it can now straddle Finch. Lawrence East Station is a truly appalling design when one considers that its intent is to replace the existing bus/SRT transfer point with a bus/GO/ST transfer. Today, buses loop into the RT station and serve a platform on its west (southbound) side with an at-grade RT-to-bus link. The northbound platform is reached through an underpass. 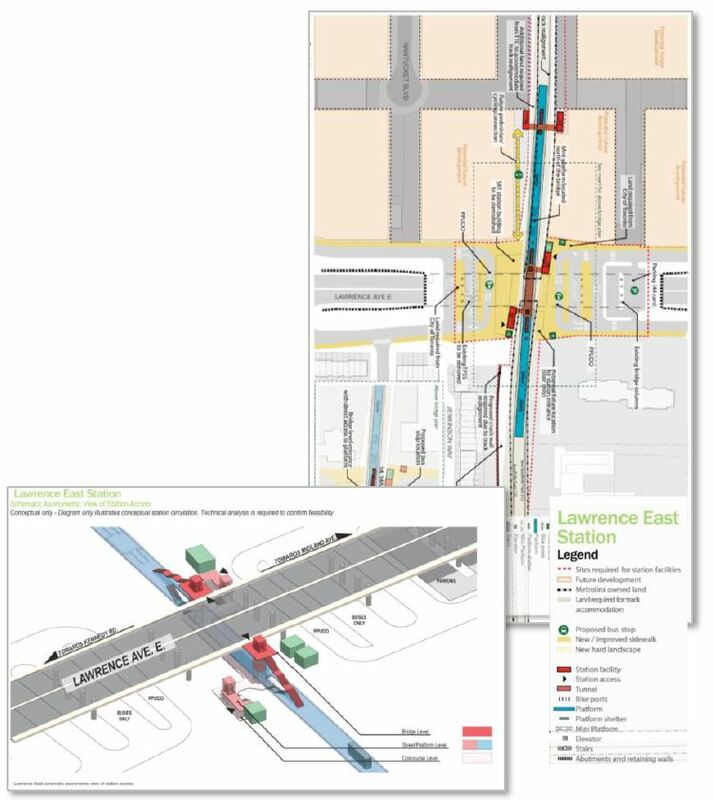 The proposed station eliminates the bus loop and places the bus transfer on top of the Lawrence Avenue overpass. Stops there would be linked to the station below by elevators and stairs, if the diagrams are to be believed. There is no evaluation of the need for shelters for stops that would now be very exposed at the top of the bridge, nor for the capacity of transfer movements between the trains and buses. 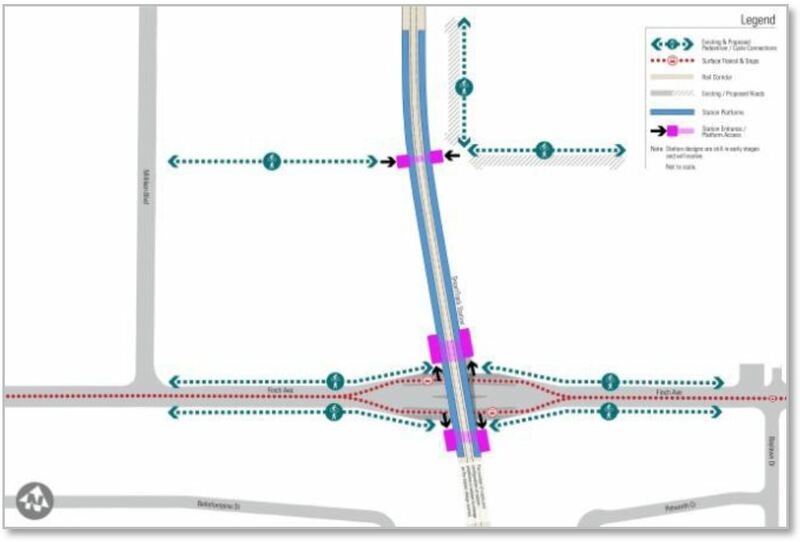 This ludicrous arrangement is the end result of reconciling the Scarborough Subway (which has lost its Lawrence East stop) and SmartTrack (which in theory provides a replacement for the RT connection). 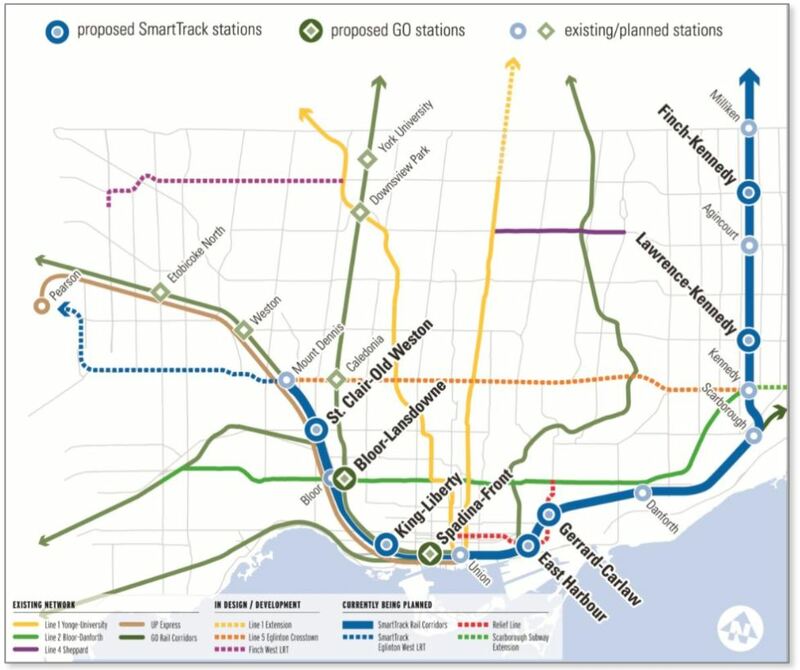 Still to be determine is the fate of the RT station and service which cannot possibly co-exist with the SmartTrack design, but which Council has committed to keeping in service until the Scarborough subway extension opens (supposedly in the 2025 timeframe). 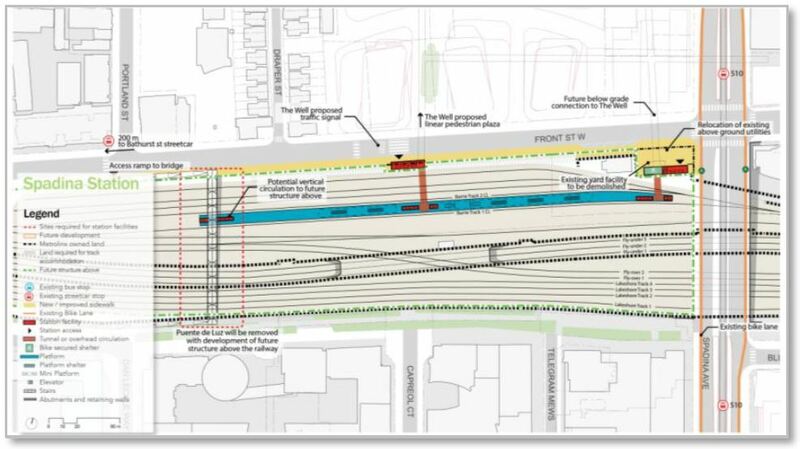 The station at Bloor/Lansdowne was added by Metrolinx to placate the neighbourhood in its fight against the “Davenport Diamond” project that will create a grade separation at Dupont where the Barrie corridor passes over the CPR North Toronto Subdivision. The battle cry, in brief, was that if they had to put up with the rail overpass, they wanted a station too. Alas, it is unclear just how convenient this station will be. 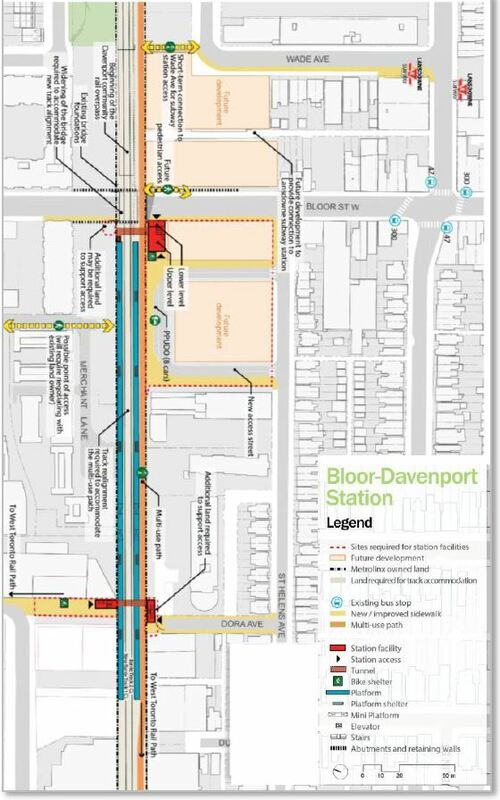 Physically it must lie south of Bloor Street to provide room for the rail corridor to rise above the height of the CPR by the time it reaches Dupont. The Barrie line is some distance from Lansdowne Station, and that station box lies to the east, not to the west, of Lansdowne. By the time the BD subway reaches the rail corridor, it is in deep bore tunnel, and is not in striking distance of an easy extension west from the existing station. This is not a “SmartTrack” station or even corridor, and it is unclear what fare arrangements would exist for riders using this line as part of their commute to downtown. One might argue that with a direct subway-to-GO link pending at Dundas West Station, subway riders would be much more likely to make the transfer to a GO service at that location if they were bound for downtown. The station at Spadina and Front would be located the yard now used by GO for midday storage of trains. The service concept is that Barrie line trains would terminate here and passengers would then, somehow, find their way into downtown. This would work for people on the corridor who worked west of the core, but otherwise, they would face a hike east from Spadina. 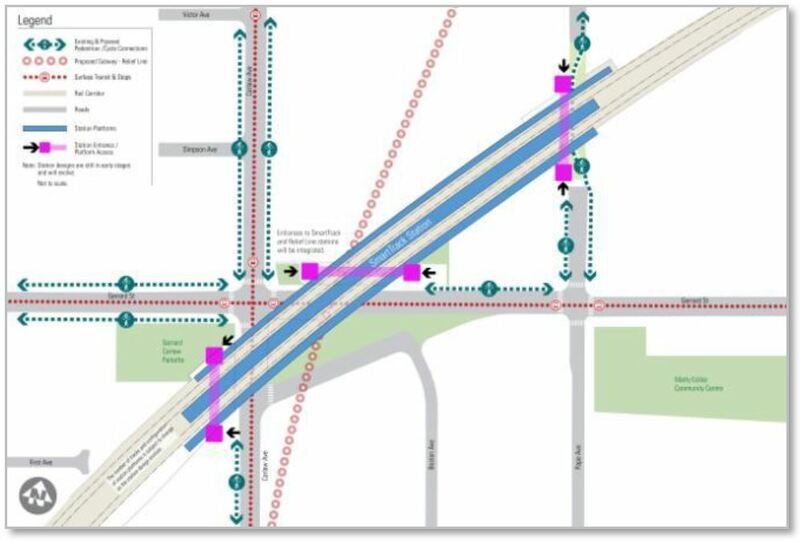 When this was first proposed, there was a scheme to bring the Relief Line to the same location as a downtown distributor, but with that line’s shift north to Queen, such a connection would be difficult if not impossible. Update October 13, 2017: Metrolinx confirms that Barrie line trains will in fact operate through to Union Station. This presents operational problems because of conflicts with track occupancy and platform usage. 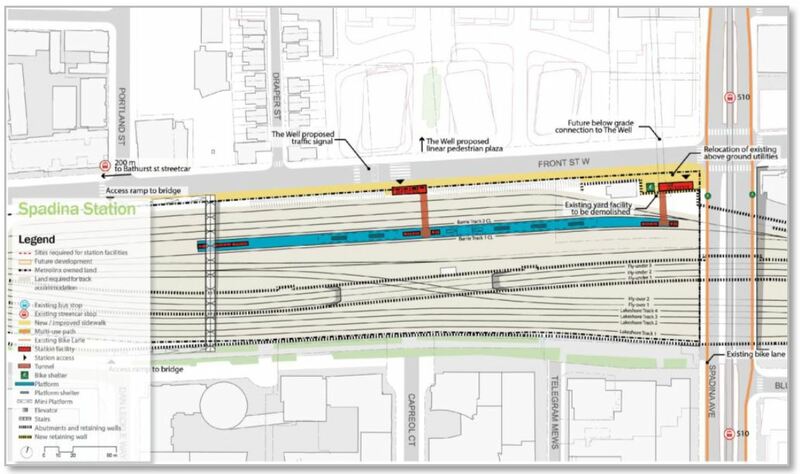 In the diagram below, it is clear that there will be one track east of Spadina Station leading east to Union. 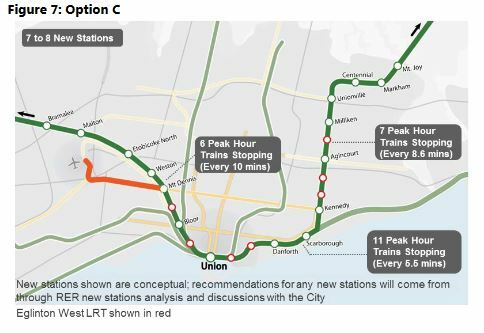 Current plans for the Barrie corridor call for a 15 minute peak service with the result that the link to Union would see a train every 7.5 minutes on average. That is easy to achieve on single track, and indeed the UPX now operates to its terminal in the same manner on a 15 minute headway. However, the tracks at Spadina Station are on the north side of the corridor, north of the UPX approach to Union. If the Barrie trains do not shift to Track 1 (displacing UPX), then the two services must cross each other’s paths with a total of 16 movements per hour. This is doable for urban transit operations (subway terminals have more conflicting movements), but far from ideal and it would create a barrier to service upgrades on either line. It is hard to believe that in 10 years the electrified Barrie corridor will be constrained to four trains/hour. As for UPX, this is bound up in the more complex set of plans for the Kitchener corridor that could eventually host UPX, RER trains and a high speed service to London. If, by then, the “UPX” service becomes a shuttle operation between the Kitchener corridor and the airport, the need for a “premium” station on Track 1 at Union will disappear (although High Speed boosters will no doubt want this space for their showcase service. 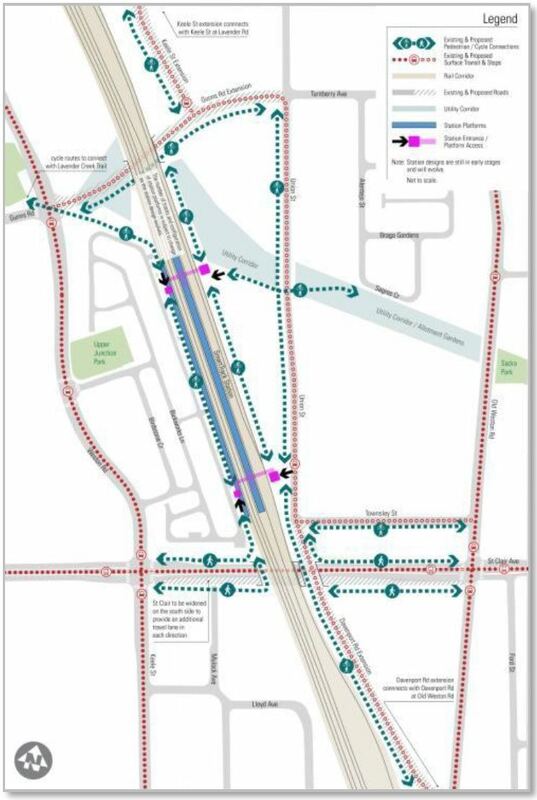 The revised version of the station includes provision for access from the proposed Rail Deck Park. Such access would have the advantage that the station would not depend on the relatively narrow sidewalk space now available on Front Street, but this still leaves the problem of circulation east to the core. Following these meetings, there will be a further set of refinements to the designs and evaluation of environmental issues for the sites. The next round of public meetings will be in early 2018, and the whole matter, including updated cost estimates, will go to Council later in the spring with the intent that Metrolinx could issue an RFP for construction in the fall. Totally outside of the official study are the political considerations at both the City and Provincial levels. At the City, there will be a strong push to keep the idea of SmartTrack as a real addition to local transit alive despite service designs from Metrolinx that suggest ST will not be as good as its advocates claim. How much added station cost the City is prepared to bear to keep ST alive remains to be seen. The two Barrie line stations are to be funded by Metrolinx, but the six ST stations are on the City’s tab. Then there is the small matter of who will be in charge at Queen’s Park by fall 2018, and how warmly they feel about Metrolinx and its many projects. 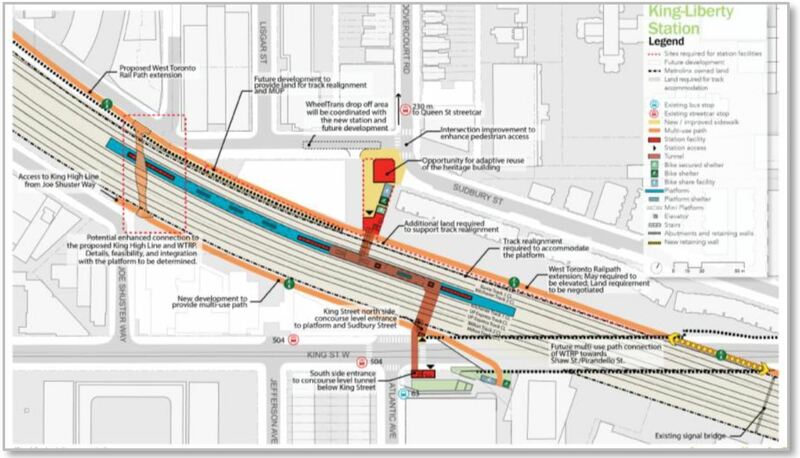 With respect to the Eglinton West LRT, nominally part of SmartTrack but not part of this round of meetings, the City expects to have an update for this project out for consultation in November 2017. One of the questions nobody in the political realm seems to be able to answer is “just what is SmartTrack service”. This question was answered in the June 2016 Metrolinx report which examined four options and explicitly discarded two that would have involved extra “SmartTrack” service overlaid on the planned GO-RER operations. Options C and D have the same service levels, but these vary along the route. Different long-haul service levels are mixed in with a service of “short turn” trains every 20 minutes. For example, the Stouffville corridor has four trains running through to Lincolnville plus three trains that would turn back at Unionville. On Lake Shore East, the combined service is more frequent because four of the Lake Shore trains make local stops each hour on top of the seven originating from the Stouffville line. The combined service levels shown here may change due to improvements in the planned through services (notably on the Kitchener corridor), but limits remain on the amount of service Metrolinx will agree to operate for the investment they are prepared to make in infrastructure. This entry was posted in A Grand Plan, Commuter Rail, Downtown Relief Line, GO Transit, Scarborough RT/LRT/Subway, SmartTrack, Transit. Bookmark the permalink. The answer to your question is simple, the regions affected would experience a loss of competitiveness and you would exacerbate the already dangerous levels of socio-economic polarization. To be successful these regions need to grow through productivity gains, not population growth. Jon Johnson – why would they lose competitiveness, you are increasing not decreasing choice for developers. There is an ongoing choice to build 2.25 spots and one spot per use, simply no longer a legal requirement to do so. Markets normally do better with more, not fewer degrees of freedom. Please note, the rich have 2 cars or more the poor do not. Requiring excess parking generally would be a transfer from those who cannot afford cars to those who can. You are making developers build spots in malls and apartment buildings that will not be used, or see little use, and then this is put into the cost of occupancy, which the consumer then pays. I am not here concerned about the developers. It is the established communities that have been designed to be car dependent that are the concern. Even with reduced number parking spots per new development the natural propensity of an individual is to take the automobile not public transit. So given the dispersed employment opportunities across the region and the economies dependency on a flexible transient labour force you are actually creating greater traffic by encouraging urban sprawl. What you are not accounting for is that these behaviours will create negative externalities for the communities that are not designed to deal with these added costs. Increasing traffic makes the car less competitive, and replacing it with the subway will create a “last mile” problem for most existing residents, and in aggregate cause a decline in the quality of life for the affected communities. The concept of “natural propensity” in this circumstance is wholly fictitious. There is no “natural” state of existence – is it more natural to be wealthy than poor? Is it more natural to live in downtown Toronto than Markham? Individuals have a greater or lesser number of choices based on circumstances. A wealthier person is more likely to use an automobile than a poorer person, and a person living in downtown Toronto is more likely to use public transit than a resident of Markham. It does not follow from these observations that there is a natural order that is being aided or thwarted by circumstance. All of us have biases, in ways we are aware of and in ways we are not. I do not think there is any true objective answer to the question, “What is the best possible use of X number of dollars?” because our biases cause us to weigh the many priorities of society differently from one another. At best, we may reach a limited agreement on certain issues that are broadly important to many of us. Coating one’s biases in a thin veneer of economic jargon is not a substitute for fact-based evidence or subjective persuasion – it is simply a rhetorical flourish meant to end debate by justifying one’s biases as “fact,” as superior to my biases, Steve’s biases, or anyone else’s biases. Economic theories have limitations when applied to real-world situations, and therefore using them as a substitute for informed thought is at best troublesome, and at worst foolish. I would note, there is a strong argument regarding externalities would apply better to the how new communities are develop ignoring the impact of traffic on previous development. Removing the artifices of extra parking might reduce the impact of this externality. The “natural state” of taking a car, is heavily influenced by the nature of free parking at each end of a trip, and the need to walk across the sea of parking at the destination end mandated by existing zoning. It is also important to note the reality of the large increase in development in areas that are not covered by such zoning (ie old city of Toronto) and the large increase in popularity of pedestrian oriented neighborhoods. The fact remains we are in effect mandating the space cost of second cars on developments, and thus distorting the private choice. Developers would still have the choice, and frankly merchants choice between malls etc. The primary external cost on previous development is the impact of cars, which current policy encourages. I agree with you, however where we differ is how to manage the externalities. I prefer a more compact form of growth that builds economies of scale that would provide greater employment opportunities and a higher quality of life for all residents. Although I agree that the number of parking spots should be limited on new construction, if you have a more compact form of growth the likelihood that the needs of residents would be satisfied by transit is much higher. I would argue that new residents living along Queen st would not need a car and most likely will not even want one. I disagree with your position because you will be building growth in a way that you deny a resident access to an automobile when they may either want or need one. My position is to create conditions where the quality of life is so high that a resident considers having an automobile irrelevant, and would forgo the possession of one even though they can otherwise do so. The fact is there is substantial internationally respected research to show that there is a natural propensity for individuals to favour personal vehicles. The key to overcoming this bias is to provide the individual with conditions that would provide them with a substantially higher quality of life with a transit based life style. Achieving more compact growth is one of the reasons to reduce the parking requirement, and increasing the times coverage allowed. Parking is often one of the things that consumes a lot of space and when combined with limited coverage, it encourages building a very low density development. The issue I have is that by mandating very high parking requirements we are forcing seas of parking which perforce decreases density. Once you have consumed a large amount of land in parking, the logic of building up is also weaker. Note I was suggesting reducing parking requirements to encourage density and make transit more effective. Density also helps transit. I am not denying the resident access to car, I am suggesting that we reduce the mandated parking per residence to 1, the market would then likely provide for additional spaces, but at a cost no higher really than the current one. The cost of the parking spot is either buried in the price of the condo, the price of the house or my rent, it does not disappear. However, if I do not need it, and on average condos only require 1.25 spots per residence, not 2.25, then the builder would likely build 1.4 once he has worked it out, and may even charge units for the extra spot. This does not deny the idea of parking, it just creates a market for it, as opposed to a mandated surplus. Note I am suggesting reducing the amount of parking required by zoning. Not mandating that builders reduce the parking. Today 1 spot per use commercial and 2+ per residence, means there are generally many empty spots in areas so zoned, and residence buying cars that would not have been the best option were they not already paying for the space. I lived in the OneCole development at Regent Park from 2013 through the end of 2015. The unit I rented came with a parking spot. I didn’t have a car, though I occasionally used the spot for guests (though there was separate guest parking), I also would walk through the lot as a short cut a few times per week. I swear it was never more than 50% full. Not ever. There were about 80 parking spots eternally empty for all three years. The lobby was continuously plastered with notices of people fruitlessly attempting to rent parking spots out, with no takers. The shift off of cars has in many places already happened. It’s already history. The regulations here are a decade behind what is now required. The research that I am quoting refers to the statistical mean of a population distribution. The community that you are referencing is known to be one in which there is systemic poverty. I would suggest that your reference does not illustrate the natural state of a prosperous community and creates an artificially skewed opinion. A better illustration would be the community that has developed around the Sheppard and Bayview subway station; there was a period in which a TTC metro pass was effectively worthless they could not even give them away. The economics behind an inferior good such as public transit is that as you become more prosperous the less of it you want. Steve: You are showing your ignorance of the redevelopment of Regent Park. OneCole is a new condo at Dundas and Parliament close to downtown. As for Bayview/Sheppard, of course a Metropass there was worthless because the primary transportation corridor for people in that part of the world is the 401, not the Sheppard Subway. The community around Bayview Station was zoned and built using the subway as justification, but it is still a suburban location where most residents will have a car out of necessity. The difference is the location of the two buildings, not the economic class of the residents. Jon Johnson said: The economics behind an inferior good such as public transit is that as you become more prosperous the less of it you want. Yes that is clearly so in an environment where you are required to wait long period for the vehicle to show up, where there are long walks across empty parking lots etc. That is where zoning has played a part in making the access to and from transit less attractive, and thus less desirable. I would ask: would you really suggest that the residents of southwest Rosedale are poor? Do you think the high propensity to use transit in the area is due to the lack of income, as compared to say North east Rosedale, or Moore Park? Perhaps it is the easy walk to frequent transit to transit, and ready access from transit to final destination at the other end. When I lived in the area, I crossed paths with many people using the subway, and leaving their top end Mercedes in the driveway. I would suggest the reason for preference for personal vehicle has a great deal to do with the service frequency, and ease of access at both ends. The massive parking lots around shopping, required by zoning, as well as the reduced density, in effect pushed by zoning, both act to make personal vehicles the preferred solution. The reason that development in the shoulders of downtown has been so large is that it offers areas where this is not the case. Mandating parking means expressed preference at market prices is frustrated. That is, we are creating an effective subsidy to support a choice that has substantial negative externalities, rather than leaning the other way. The required increase in road, sewer runs, parking lot construction, etc all add to the costs of development, reduce density and increase longer term maintenance costs. Change the zoning, to allow a market, and you may find reduced rents, reduced housing costs, lower occupancy costs for merchants, and more pressure (and money available) to provide more frequent and faster transit. That is, change the relative quality and costs of the goods, may just alter that expressed preference, as today, zoning makes transit less attractive and cars more attractive, as so many of the costs are mandated anyway. Malcolm N said: Yes that is clearly so in an environment where you are required to wait long period for the vehicle to show up, where there are long walks across empty parking lots etc… I would ask: would you really suggest that the residents of southwest Rosedale are poor? I would agree that they are not. However people generally make their decisions according to the inherent cost profile of the available choices. You speak of Rosedale, but what about the north east section? Do they use transit with the same frequency as the others do? The answer is no they do not. When you speck about transit frequency, your thesis is dependent on the very strong concept of the value of time. Where you make your mistake is that, just as the residents in north east Rosedale use transit less than their peers in the south east so too will residents in suburban communities that have been developed for the automobile use transit less than then new developments. It comes down to the fact that the time costs to access transit are prohibitive in suburban communities, and the overall transit trip is too long. If you want to make transit competitive the overall time cost must be minimal, that is why I have been advocating for a Queen St subway. Not only does it minimise the aggregate cost to the individual but it allows for maximum growth with the minimum externality cost to the existing communities. Steve said: The community around Bayview Station was zoned and built using the subway as justification, but it is still a suburban location where most residents will have a car out of necessity. Your position is fully in line with my thesis in support of a Queen St subway. The only thing missing is the need for public policy to maximize the growth potential of the region, that would justify financing the project. Steve: No, you have totally missed my point. The primary attraction to live at Bayview/Sheppard or in the Sheppard corridor generally is the proximity to the 401/DVP. Trips that are not oriented to downtown are much better served by the road network than by the transit system, and the subway does nothing for them. Queen, by contrast, is in the middle of the city where trips will tend to be shorter, and where there is a network of routes serving them. An important point about a subway under Queen is that it would stop much less frequently than surface transit (compare the Sheppard subway and bus service). That’s fine if you are travelling from one station to another, but not if you live between them. Well, I certainly can’t argue with that! Jon Johnson said: I would agree that they are not. However people generally make their decisions according to the inherent cost profile of the available choices. That is the entire point with regards to current zoning for parking and density. We are pushing relative costs towards favoring the car. The entire point of Rosedale, was the south west is very well served by transit, the service in the north east not so much. Hence the relative costs skew strongly one way. If we force massive parking lots around all services, rather than encouraging a situation where there is a market for parking we create a forced reduction in the costs of the car. If it is zoned to require a parking spot, I am paying for that space whether I use it or not. I am required to walk through the parking lot, from transit if it is full or not, the shop owner forced to pay the extra rent on those spots if his customers ride or drive, and the shop will charge those costs to all shoppers, whether they drove or not. Reduce the parking required by law, and you reduce the costs required, and alter the trade off. Improve transit availability (which reduced walks would help) and you alter the relative trade offs. Malcolm N says The entire point of Rosedale, was the south west is very well served by transit, the service in the north east not so much. Hence the relative costs skew strongly one way. The problem with building a suburban subway as you are suggesting is that you will always be creating a cost skew for the transit users. I am not against you position on zoning for fewer parking spaces, I simply believe that applying that principle to growth south of Bloor/Danforth will be much more effective and efficient and will cause far fewer negative externalities. Jon said: The problem with building a suburban subway as you are suggesting is that you will always be creating a cost skew for the transit users. That’s true in the absolute sense everywhere, not just in suburbs. It’s only true relative to auto facilities for densities below a threshhold, but remember that density is lowered through excess parking supply required by zoning. The average density across the suburbs served by the RL are certainly high enough to warrant heavy rail transit. And if you want to bring externalities into the question, then the externalities of personal vehicles far outstrip any ‘skew’ introduced by the provision of transit to the suburbs in question. Recall that demand induced by transit capacity is far less elastic than road capacity. I am not actually suggesting subway, but other lighter forms of rapid transit. A BRT can take on a substantial amount of riders and deliver rapid service, if it has a good right of way, decent stops and a solid terminus. Ottawa’s when I lived there in the late 1980s was great. You really had issues in core where there was not a real right of way, and it was clear that a lot of growth would cause concerns eventually at the Rideau Center terminus area. The 500 meter walk I had to my local station made it an awesome way to get around, and for any trips towards core I always took transit, because it was much more convenient than driving. Zoning that made this a viable reality for a lot more development, would be extremely helpful, in that BRT would make a lot of sense connected to GO stations with reasonably frequent service, local commercial and retail areas, as well as decent off BRT connectors to other destinations. It cannot be a choice between subway and car, it has to involve starting to seriously look at other alternatives and making them attractive. The network itself is what creates value in transit, and it must be competitive to reduce congestion. Why start with zoning that makes that nearly impossible? I am quite comfortable with what you are saying overall, and I am of the opinion that the full implementation of an enhanced version of the Don Valley corridor study would be reasonable. I want to get back to my original point that looked at the need to use zoning as a way to allow substantial growth around stations along the DRL south of Danforth, doing so in conjunction with your position on parking would allow for high quality growth that would help alleviate the housing problem in this city and go a long way to justifying the financing of the project. Steve: The DRL stations south of Danforth are at Gerrard (proposed redevelopment on the Home Depot site), East Harbour (proposed development on the Unilever site), King/Sumach (north end of Distillery District with developments already planned on vacant land), Moss Park (some redevelopment has already happened, more is in progress). You seem to treat the entire DRL south as if it goes through a wasteland when, in fact, this will not be the case. All the same, the developments will not pay for the construction costs, and don’t get me started about how Development Charges work as per provincial, not city, rules that prevent a rapid transit line from being treated as a “local improvement project” only for a handful of station sites. Given that a large problem with SmartTrack is the cost of station maintenance, why hasn’t anyone pushed for LRT in rail corridors to reduce cost. The SmartTrack line proposal seems to me can work better running tracks parallel to the GO tracks just which will allow for more frequent trips while the lack of need for stations other than a shelter (and ramp to get up and down) with an LRT makes it viable, no? Steve: It’s a tad more complicated. First off, LRT vehicles cannot co-exist with mainline rail vehicles in a corridor except with adequate protection against collision due to the relative strength of each vehicle type. Second, although all that has been talked of to date is station maintenance, Toronto is on the hook for the marginal cost of running extra GO service to get headways to the “SmartTrack” service level. Third, there is the question of fare subsidies payable by Toronto to provide free transfers between the TTC and “GO” trains. And so, the cost of operating GO services under the name of “SmartTrack” is bigger than it looks. As for infrastructure, there simply isn’t enough space in the corridors to fit an extra set of LRT tracks beside GO’s tracks, especially at stations where extra width is required. As a follow-up to my last question. The SRT currently exists running parallel to the GO tracks from Ellesmere to Eglinton. If it can be done there, why not the rest of the corridors? Steve: It is parallel to but not immediately beside the tracks, and there is enough room for three tracks (plus station platforms) to co-exist. This is not the case on all corridors notably the Lake Shore and Weston corridors where there is barely enough room for GO’s trackage as planned, let alone LRT. Another vital point to note is that the only place where the RT crosses the rail line is grade separated. Well, the problem is that the Yonge line is i) over capacity, and ii) a critical link for which, in the whole east end, there is no alternative. The Yonge line is Too Big To Fail. The TTC has various ideas to improve the throughput. But it does not seem like ATC has shown itself to be the panacea that was promised. Admittedly, it’s early days and only over part of the route, but I’ve had feedback from operators who get a front-seat view of ATC. In addition, trying to improve chokepoints like Bloor-Yonge is incredibly complex and expensive. And all that will make the Yonge line Extra Too Big To Fail. Therefore the DRL is necessary to relieve the pressure on the most economically valuable transit asset in the country. Therefore the DRL is also economically valuable, and it actually makes the Yonge line more valuable, because people will be able to squeeze on without having to let several trains pass them by. Steve: There is an inherent problem in a lot of transit planning where the view is project based rather than network based. There is a value in redundancy, and in avoided cost and disruption of trying to stuff everyone onto the Yonge line, something that is not technologically feasible in any event. It’s the sort of thinking that values a one-stop subway more than an LRT network, even if we could ignore the skewed arguments about what “Scarborough deserves”. As an aside, I would mention that the DRL must go to Sheppard. 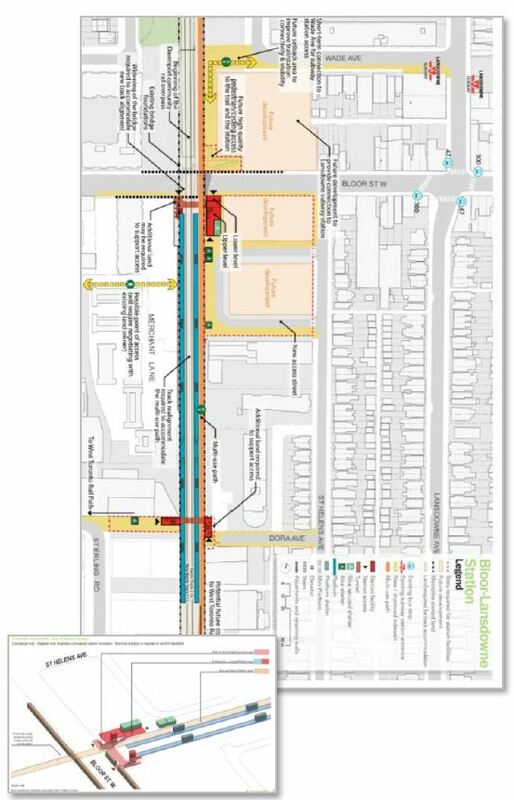 An analysis considering only the downtown to Danforth link is doomed because the offloading effect is too small, and the line would not serve a large enough new market. Note, germane to this thread, so far there is no indication that SmartTrack will provide any meaningful relief to the pressures on the Yonge line. If that is desired, then I expect that SmartTrack would wind up costing as much as the Relief Line, but with extra constraints and problems that we simply wouldn’t have with a fresh-build subway line. The promise of SmartTrack being i) inexpensive, and ii) a meaningful relief to the Yonge line, is just pie in the sky, as we have seen over the last three years. There are just enough news stories and press releases to slightly confuse me! Steve: This is tricky considering that the way ST was publicized and various GO plans have come out. Initially, it sounded as if some trains would skip certain stations, but in the review of service options, GO decided that everything would stop everywhere. Otherwise additional tracks are needed so that the express GO/RER trains could pass the GO/ST locals. The “extra” stations that will exist courtesy of the SmartTrack project are at Lawrence East and Finch East, on the Stouffville line itself, and at Gerrard and East Harbour on the Lakeshore run into Union. On the west side, there are new stations at Liberty Village and at St. Clair. Steve addressed (a) through (c). (e) “existing rail service” therefore is all stations past Unionville. Although even there, service will soon be all day, rather than peak-only. Note that “The Big Move (II)” includes extending electrified 15 minute service to Mt. Joy station within the 2041 planning horizon, i.e. to Centennial, Markham and Mt. Joy stations between the initial RER service rollout circa 2025 and 2041. 1) Metrolinx plans to electrify the ‘entire line’, which upon re-reading, probably means Lincolnville. So no diesels or hybrids required. 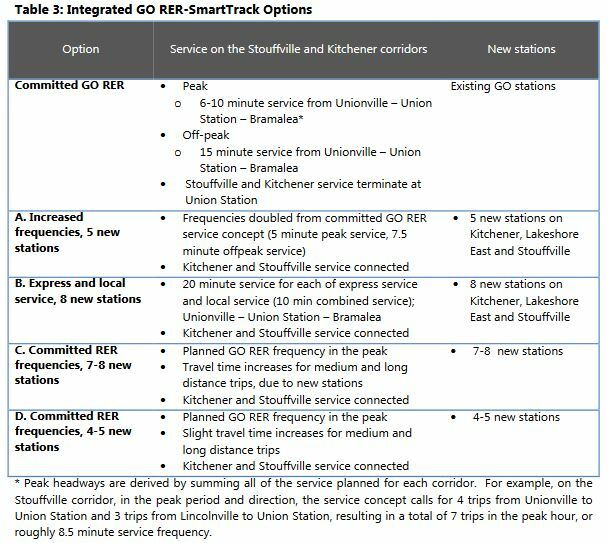 2) Double-tracking will only go to Unionville, and service in 2025 is planned for 2-way all-day 15 minute service to Unionville, 2-way all-day 60 minute service to Mt. Joy, and 20-minute peak-hours peak-direction service to Lincolnville. All of these are improvements over existing GO service, but the last is RER in name only. 3) The Big Move (II) project then would contemplate extending the double-tracking from Unionville to Mt. Joy. It’s surprising to me that the single electrified track to Lincolnville could not support 60-minute all-day service. I wonder if there’s just not enough demand projected, or if it’s a matter of physically scheduling the rest of the route. It indicates that electrifying to Lincolnville is not for capacity, but to allow all locomotives to be electric.